Want to know how to convert MP4 to FLV? The MP4 video file format is a part of the MPEG-4 standard. MP4 files can contain video and audio streams, subtitles, and metadata. The format is supported on both Windows and Mac as well as many other devices – smartphones, tablets, HDTVs, video game consoles, and more. 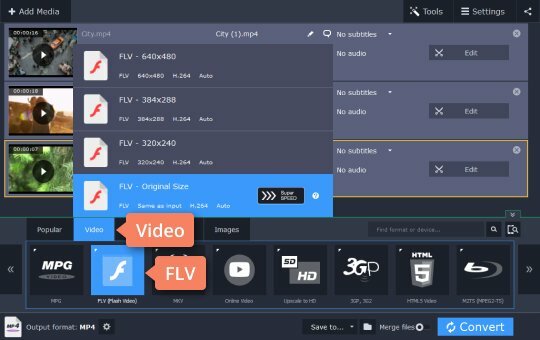 FLV (Flash Video) is, along with HTML5, the standard for streaming media over the internet and is used by over a billion people worldwide for embedded video and videos posted on social networks like Facebook or YouTube. 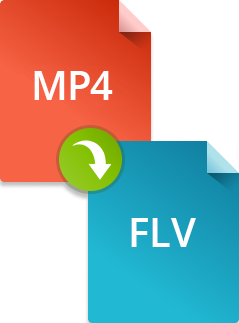 Although MP4 is widely used, some sites still recommend you upload videos in FLV format, so in those cases, you would have to convert MP4 to FLV. You can easily complete either of these tasks with Movavi Video Converter, so read this guide and learn how to transform MP4 to FLV while retaining the high quality of the original video. 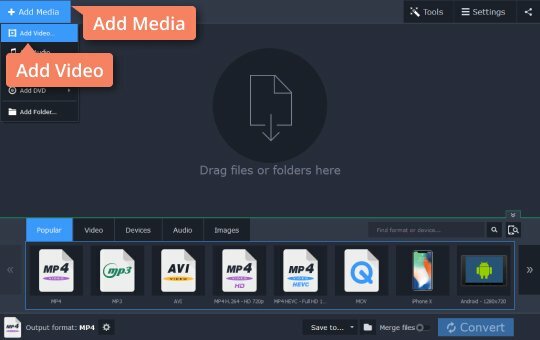 With Movavi Video Converter, you can change the format of your video, audio, or image files in one click! The software supports 180+ formats and 200+ devices, including iPhone, iPad, Xbox, PlayStation, Android devices, and many more! 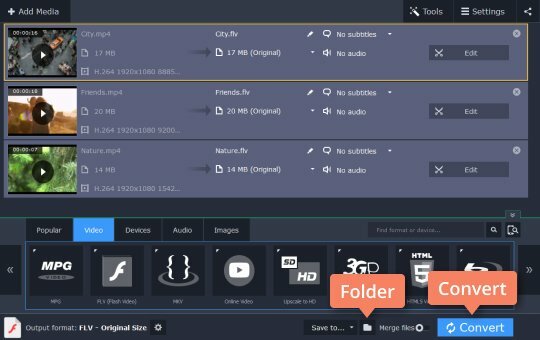 No need for any special knowledge of media formats – just run the software, open a movie or video clip, select a ready-made preset, and click Convert. Don’t worry about anything, just follow the easy steps below! Download the installation file. When the process is complete, run the file and follow the on-screen instructions to set up the software. Click the Add Media button in the upper left corner of the interface, then select Add Video. In the dialog box, choose one or more files to convert and click Open. 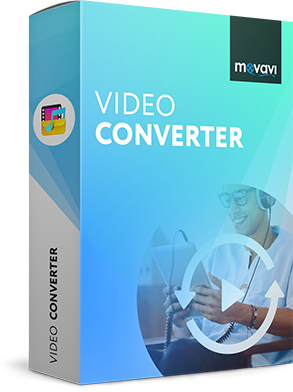 Movavi Video Converter supports batch conversion, so you can add multiple files and convert them all at once. 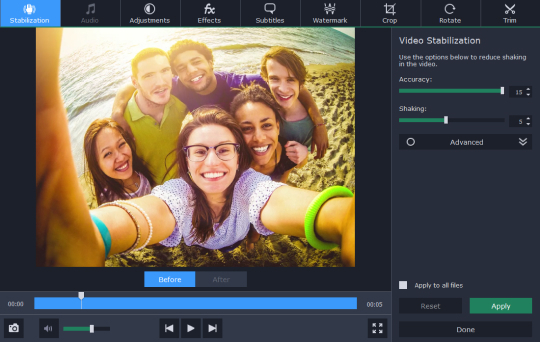 The app gives you the option to edit any video prior to conversion. Hit the Edit button in the file info section to access the editing window. Stabilize your shaky videos via the Stabilization tab. Change the volume level if it’s too low or even get rid of background noise in Audio. Experiment with video display settings in Adjustments to achieve your desired effect. Insert subtitles, watermarks, and effects using the appropriate tabs. Trim away unwanted details from the videos, rotate the footage, and crop the edges – just select the appropriate tab on the right. Select Video in the lower part of the screen, then choose FLV (Flash Video) and select the appropriate ready-made preset. To enable SuperSpeed mode, choose FLV – Original Size. Using SuperSpeed lets you convert your video up to 79 times faster, with zero quality loss. Click the Folder button with the folder icon next to the Save to field and specify the folder where the program should store converted files. Finally, click Convert. To share converted videos online right from within Movavi Video Converter, just click the Share button in the upper right corner and select the website to upload your files. Note: To upload a video to other websites directly from the program, you'll need to first download the Share Online app. The software will only take about a minute to install. Besides, Share Online is completely free, so you don’t have to spend your money on it! Once Movavi Share Online is installed, it will open automatically every time a conversion is completed. The converted files are added to the program automatically. You can select where to upload your files from YouTube, Facebook, Vkontakte, Amazon S3, and FTP. Specify the required file information (tags, description, category, privacy settings, etc.) and click Upload. Note: If you don’t need your files to be converted, you can also launch the Movavi Share Online application from the Windows Start menu and use it for uploading video and image files to the internet independently.